Fear is a funny thing. It is real and it’s very concrete in a way. Once fear takes a grip on us, it paralyzes us. And also in fear, we feel like we’re very small and powerless. And also when the fear attacks us, often we locked the door and we want to be behind the closed door. Fear does many strange things in our lives. All kinds of things it does today. You see a group of people who are completely paralyzed by the fear. They were the disciples of Jesus Christ. So let us look at when it was evening on that day, the first day of the week, and the doors of the house where the disciples had met, were locked for fear of the Jews. I mean physically, literally that happened. But also I think it has a symbolic kind of message there. They were so scared. They lock all the doors and they kind of hid behind the closed doors. I mean, after Jesus died to think the Jewish rulers would have just left him alone. I don’t think so. They would have looked for other disciples who were part of that movement which caused so much trouble for them. They wanted to arrest them. If they could, they would have killed them. So they just wanted to get rid of the seed of that movement altogether. That’s why they were looking hard for these disciples and that’s why the disciples were really, really scared. 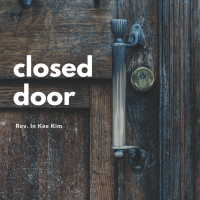 But the risen Lord did not leave them alone behind a closed door, that’s what our risen Lord does, when we are behind a closed door, our risen Lord does not leave us alone there. So the risen Lord came to them, and this is what he says when it was evening on that day, the first day of the week, and the doors of the house where the disciples had met, were locked for fear of the Jews. Jesus came and stood among them among them and said, peace be with you. It’s unshakeness. Nothing can shake you, but fear. You’re just shaking all over the place. The risen Lord gave the disciples this peace, it was very different from what they felt at that time, and I had this image, imagery, that peace Jesus gave kind of entered into them and swallowed up the fear, that kind of image I got. Jesus gave him the peace and peace entered into our soul and swallowed up our fear. And then Jesus sent them out. Don’t stay there behind the closed door. Go out. That’s what Jesus said. Jesus said to them, again, peace be with you as the father has sent me, so I send you, don’t stay here. I’m going to send you. You gotta go out and you got to live what you’re supposed to do. Doing what you’re supposed to do. Don’t just stay behind. Today’s story is almost like is a turning point for disciples. Until then, they really did not know Jesus until then did they were people or fear, but after that they were radically different people. They went out and live with confidence. They locked the door tight, but no door. Doesn’t matter how tightly they lock it cannot keep the risen Lord from coming in, Jesus broke through their tightly closed hearts and entered into the depths of their soul and chased out the fear by giving them peace. I realize a piece is more powerful than fear. Once we have peace, that peace will be able to chase out. I mean once we have peace, the peace will be able to chase out the fear. I believe the peace is more powerful than fear, so the personal who lives with peace is more powerful, can live more powerfully than people who live with fear. When we have fear, we close our heart. We don’t let anyone come. No matter how long and painfully maybe we think that that is the safest thing to do. They just closed their heart. They don’t let anybody come in. They get locked up. We have this one week of an examination of the ministers candidate drink theological school. They have to go through this one week process and there were examiners who examine all of these students. And a few times I went to that conference as an examiner and a few people I rejected there. The reason that I rejected them was after one week I told my other counsellors, I don’t know them, I talked with him. I interviewed them. I don’t know who that person is. I don’t get a sense of who that person is because that person is so locked up. He or she doesn’t let anyone come in. You may be safe behind the closed door, but you will not have freedom. You shall know the fear and the fear show make you safe. This is not a scripture verse. This is what I wrote. True, but Jesus did not teach that. Jesus taught this. You shall know the truth and the truth shall set you free. So decide. Do you want safety or do you want freedom? Fear may give you safety, but only the truth will give you the freedom. People who are in fear always look for safety. They always choose the safest way, but the people of resurrection have peace of Christ and confidence they can come out of the closet, come out of the closed door. Because they have confidence, they can be creative. Because they have confidence, they believe that the uncertainty of the future is not something that they should fear or avoid at all costs, but to embrace it because they trust the promise of God. The promise of God is stronger than the uncertainty of the future. People who are in fear will look at everything in life with a negative attitude. They see life as an enemy to win and defeat, but the people of the resurrection do not see their life as an enemy. They see it as an opportunity. The way you look at life is different depending on what you have. If you have fear, you will look at life as an enemy. If you have peace, you will look at life as an opportunity. People in fear also see other people as enemies. They guard themselves against them. They cannot open their hearts to them because they’re too scared to be hurt and their relationship relationships become very difficult. They cannot relate to people. The risen Lord brought the disciples out of the closed door. Jesus made them the people of resurrection and gave them the power and authority. This is a first time Jesus met the disciples after he was risen. First time he told something, and then this is the last time he would have said this. In other words, the most important things that they were supposed to do. Jesus told him into the story. This is what you gotta do. This is how you’re going to live your life. Before he was taken up, ascended into heaven. This is what he left with them and then he gave them the power and authority, and what is that? Verse 23. If you forgive the sins of any, they are forgiven them. If you retain the sins of any, they are retained. This is a power and authority. Jesus left the disciples width. This is what we are supposed to do as the people of resurrection, as the disciples of Jesus Christ. To forgive somebody is the most difficult thing in the world and that Jesus left us to do that, but you know how hard it is to forgive anybody? When we are in fear, we can never forgive anyone. Forgiveness is not possible in fear. In fear, you can only see hatred, condemnation, anger and division. To forgive others and to to embrace their faults and weaknesses. You need power and I believe that power is the power of resurrection. That power is the power of the spirit that frees us, humanly is impossible, but only through the power of the spirit we can do that. Last Wednesday was the 50th anniversary of the assassination of Martin Luther King Jr. He fought for the black people in US. He fought for the weak and the vulnerable people who are victims of racism, but he never fought the fight with hatred. He always fought the fight with the attitude of forgiveness. This is what he said, forgiveness is not an occasional act. It is a constant attitude. That’s how he thought the racism in US, and this is also what he said, darkness cannot drive out darkness. Only light can do that. Hate cannot drive out hatred. Only love can do that. He fought the fight as a person of resurrection. He didn’t build the walls. He didn’t fight in the closed door. He came out to the light and fought it with love and forgiveness and that’s the only way and God gave that ministry to us. People of resurrection should go out and live our life of forgiveness. That’s our portion. God did not tell us to go and condemn and judge others. That’s not our portion. God told us to go out and forgive. Do the ministry of forgiveness. Fear goes to anger, anger goes to violence. That’s what we see in the world around us every day, but God called us to go out and do the ministry of forgiveness. Let us come out of the close door and enjoy the freedom. The freedom is the freedom to forgive. That is what the people resurrection should do. The disciples did that. As a matter of fact, they gave their life away. Just to do the ministry of forgiveness, are there people that you need to forgive or do you need forgiveness yourself so that you can come out of that fear and live a life of freedom.